Institute of Eminence - Jio Institute Controversy - IAS - Daily Current Affairs, IAS Syllabus Exam Strategy, IAS Preparation. 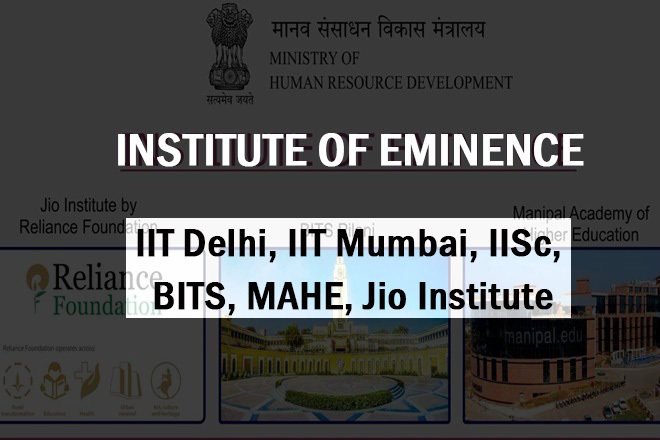 The government has chosen six institutes including three public and three private institutes to grant the status of Institute of Eminence. Among these three public institutes will be provided with Rs. 1000 cr. over next five years while other three private institutes will get academic and administrative autonomy (but no such fund). 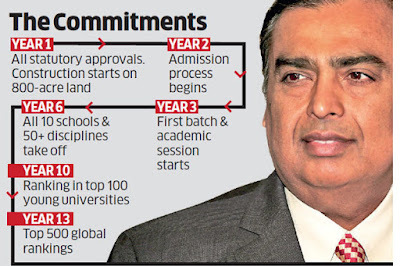 The Jio Institute is yet-to-be-set-up by Reliance foundation and is going to receive a letter of intent instead of the title of eminence now. Only after establishment and delivering promises within three years, it will get the title. Some of the administration critics viz. Ramchandra Guha, Prashant Bhushan, Ayesha Kidwai have raised question suggesting there is some foul play in the granting this status to a non-existent institute owned by a business conglomerate, while another deserving left behind. The decision of selection is made by a high power committee consisting of very highly qualified academician from India and abroad chaired by former CEC N. Goplaswami. There are different categories of institutions and 14 more are there to be selected. Jio Institute fulfills more the requisite criteria compared to other applicants, they are having 800 acres of land, Rs. 9500 crore invest in the project. There will be regular review and they will have to fulfill the promises and in three years they will have to establish of institution infrastructure. Government is looking at the capacity of an institution other than its academic or research portfolio. Capacity to put up best infrastructure, fund future research works, capacity to get highly qualified researcher, capacity to create knowledge pool. Govt has issued the notification but has excluded the name of BITS Pilani. The reason behind this hold attributed to the fact that BITS Pilani is court against UGC in Delhi High Court.